The Sound of Music premiering (2nd March 1965 in US, 29th in the UK) and 40 years since the silver screen release of the Who’s rock opera Tommy (19th US, 26th UK). Starring Julie Andrews and Christopher Plummer, and featuring unforgettable songs penned by Rodgers and Hammerstein, The Sound of Music is the story of a young woman (Andrews) who leaves a convent to become governess to an Austrian naval officer’s seven children. Filmed on location in Salzburg, Austria and around the German region of Bavaria, studio scenes were finished at the 20th Century Fox studios in California. 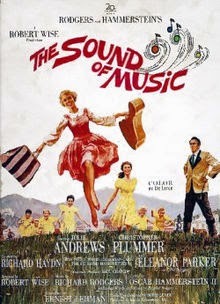 Including such memorable tunes as "Edelweiss", "My Favorite Things", "Climb Ev'ry Mountain", "Do-Re-Mi", and the title song, “The Sound of Music," the film won 5 Oscars including Best Picture and became (at the time) the highest grossing film of all time. 10 years later, the Who’s 1969 rock opera album Tommy was adapted and released on to the big screen. 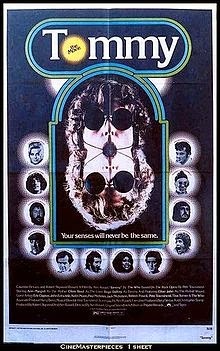 Directed by Ken Russell and starring Roger Daltrey with the other members of the band, such star names as Ann-Margret, Oliver Reed, Eric Clapton, Tina Turner, Elton John, Arthur Brown, Paul Nicholas, Robert Powell and Jack Nicholson made up an impressive cast list. Ann-Margret won a Golden Globe award for her performance. At the outset, Elton John turned down the role of the Pinball Wizard and UK pop star David Essex (amongst others) tested for the role. Eventually Elton agreed to play the part, on condition (it is believed) that he could keep the giant pair of Dr Marten’s boots he wore. Much of the movie was shot around the English south-coast city of Portsmouth along with scenes at the Borrowdale Valley in the English Lake District. It is many years since I have had the pleasure of watching either movie, but the anniversaries are surely a good reason to get hold of the DVD’s and once again indulge.